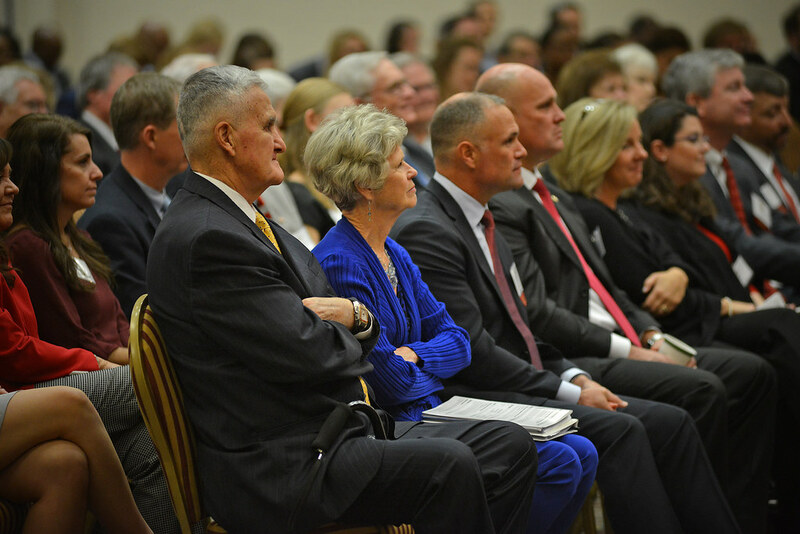 Tom Miller, Andy Albright, Jane Albright, Gen. Hugh Shelton and Chancellor Randy Woodson (right) after the announcement of the Albrights' $5 million gift to NC State at the annual General H. Hugh Shelton National Leadership Forum. 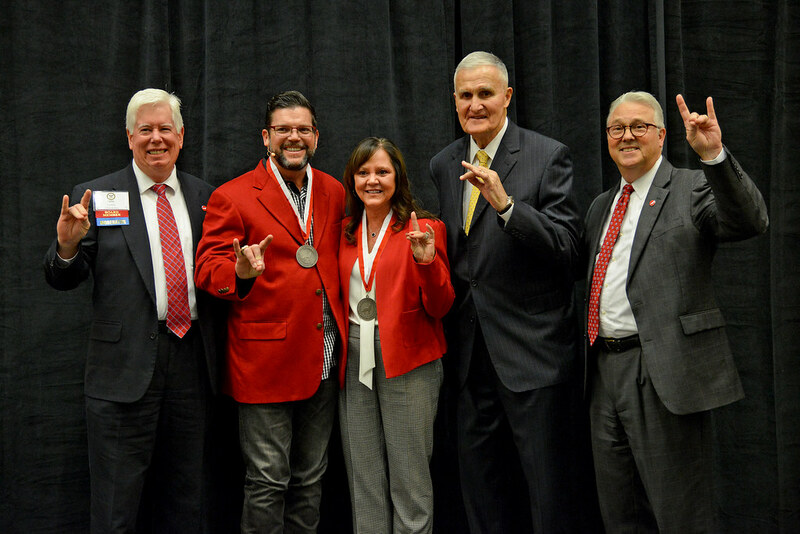 A $5 million gift from NC State University alumnus Andy Albright and his wife, Jane, will bolster both the NC State Entrepreneurship Initiative and the General H. Hugh Shelton Leadership Center, Chancellor Randy Woodson announced. 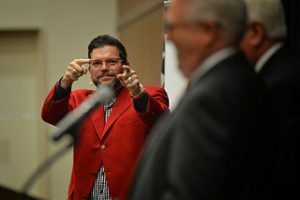 Andy, a 1986 graduate of the College of Textiles, said he’s excited to invest in NC State students. 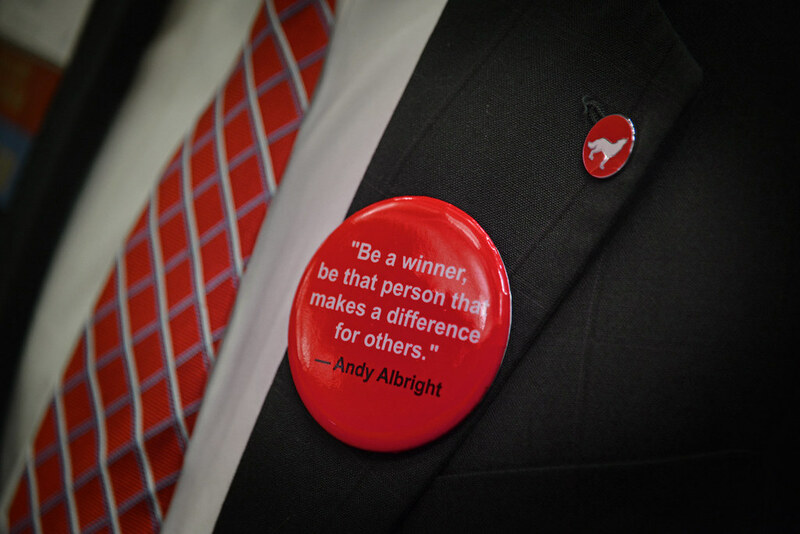 In honor of this extraordinary commitment, Innovation Hall — which opened on Centennial Campus in 2014 — will now be known as Andy and Jane Albright Innovation Hall. 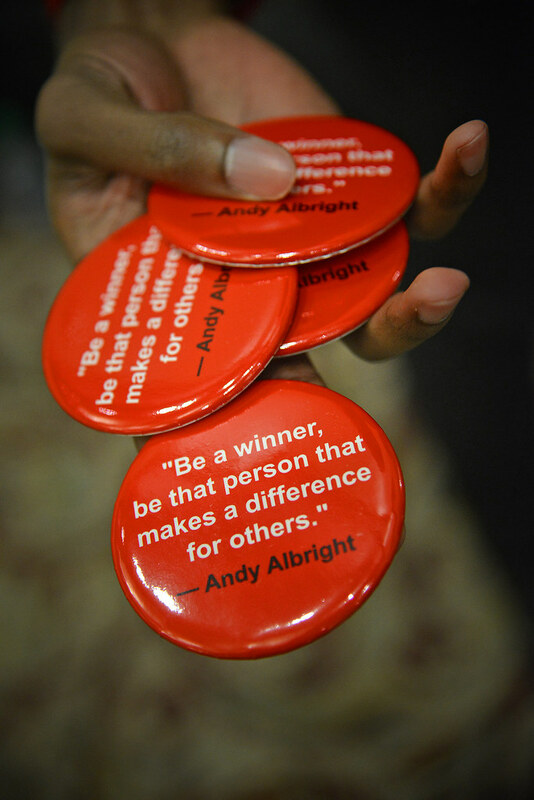 One component of the Albrights’ gift is an endowment for the Albright Entrepreneurs Village, a Living and Learning Village the Burlington, North Carolina, couple previously established. NC State’s Living and Learning Villages are interest-based communities that engage students inside and outside the classroom. 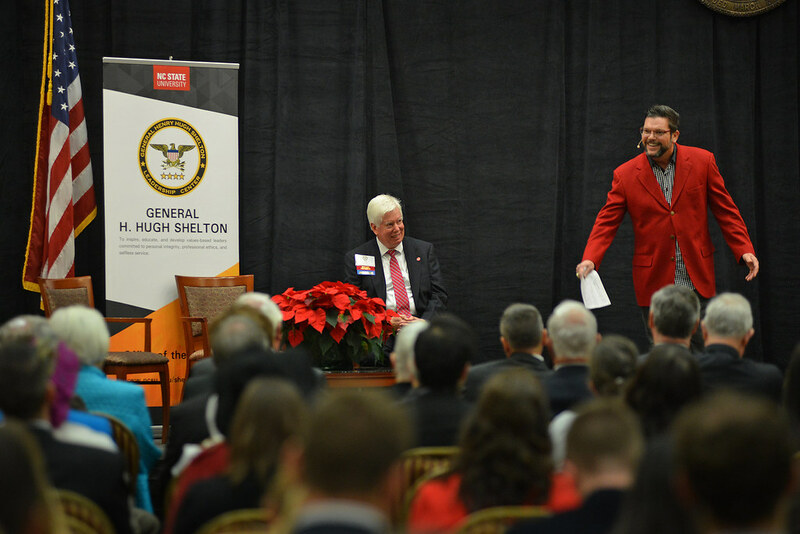 Miller said the Albrights are “building a bridge” between the Entrepreneurship Initiative and the Shelton Leadership Center. 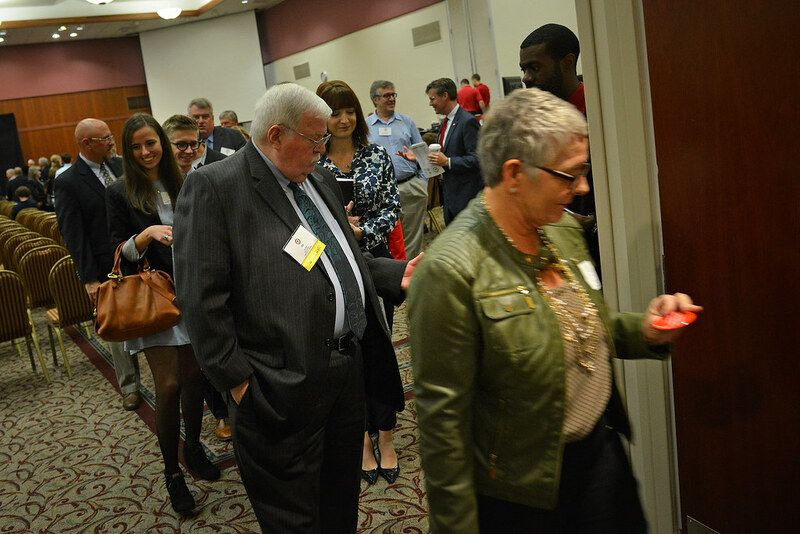 The Albrights are also creating the Shelton-Albright Entrepreneurial Leadership Youth Program, which will be administered jointly through the Entrepreneurship Initiative and the Shelton Leadership Center. The program will be aimed at high school students in North Carolina’s rural counties who have an interest in entrepreneurship. Barbara Mulkey, director of the Shelton Leadership Center, said the Albrights’ support will take the center to the next level. 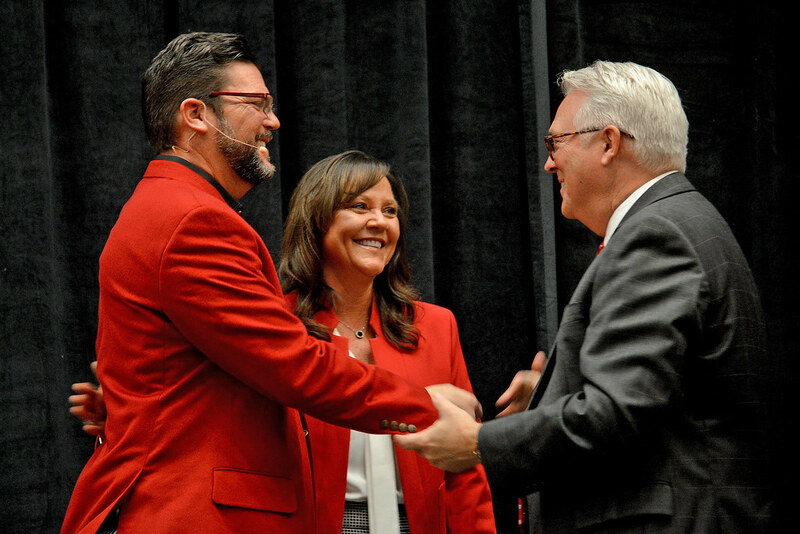 Support from the Albrights will allow the Shelton Leadership Center to move from its current offices in the McKimmon Center to Valley Hall on Centennial Campus. The move will give the center additional space to conduct workshops and courses. 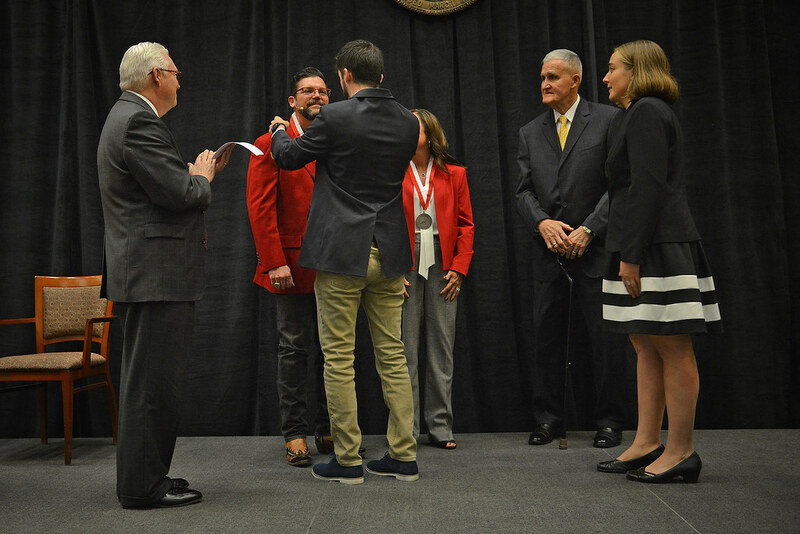 Just last month, NC State launched the public phase of the Think and Do the Extraordinary Campaign, the most ambitious fundraising effort in university history. NC State’s alumni and friends have already committed more than $1 billion toward a goal of $1.6 billion by Dec. 31, 2021. 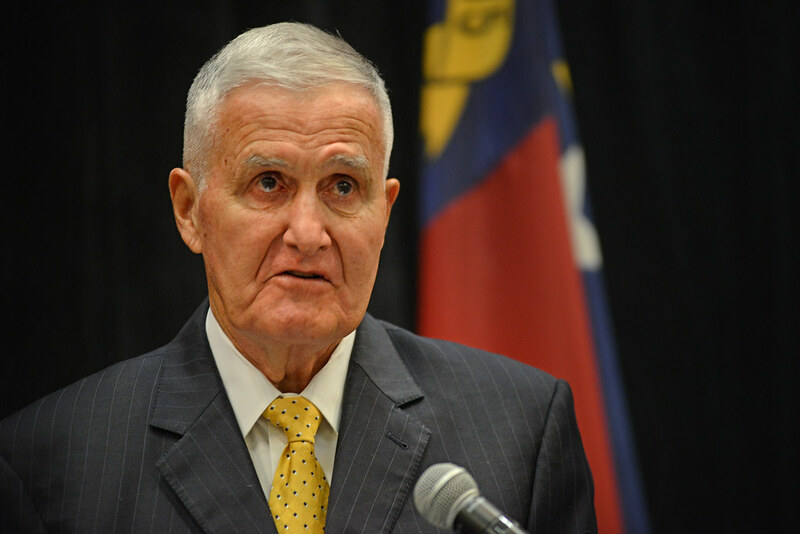 Woodson noted the Albrights helped push the university past the $1 billion mark. The Albrights’ gift supports all five of the Campaign’s priorities — leadership, experience, purpose, places and opportunity. Andy, who serves on the Entrepreneurship Initiative Advisory Board, said he wants to lead by example and encourages others to support the university. 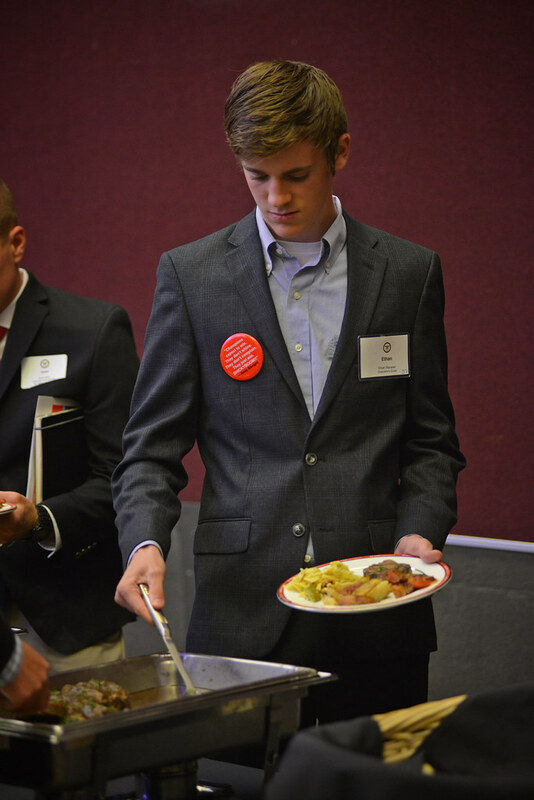 Will Duke, a sophomore studying computer science, found out about the Entrepreneurship Initiative during a visit to NC State while he was still in high school. Now an NC State student and aspiring entrepreneur, he takes full advantage of the initiative and the Albright Entrepreneurs Village. 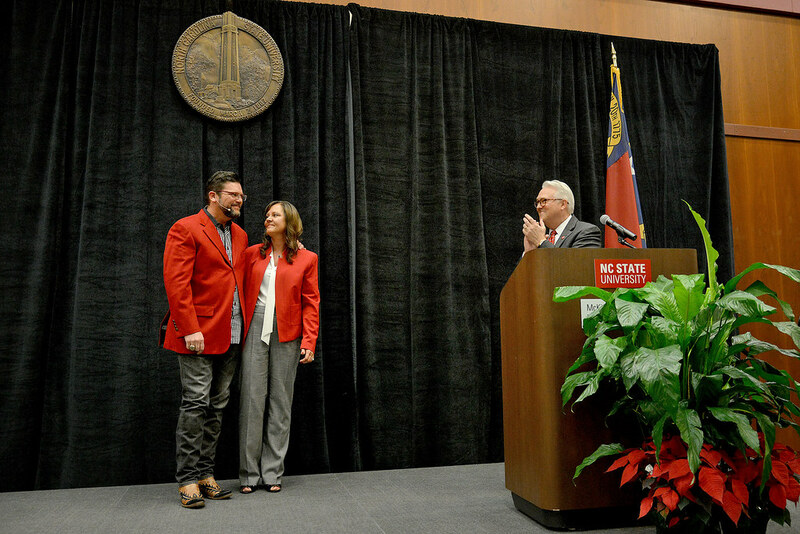 He appreciates the impact of philanthropy from the Albrights and other friends and alumni of NC State.